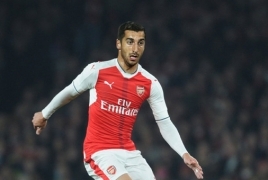 PanARMENIAN.Net - Arsenal star Henrikh Mkhitaryan is out to put the past behind him this season and become ‘someone new’, The Daily Star says. Mkhitaryan ended his difficult Manchester United stint in January when he completed a blockbuster swap deal with Alexis Sanchez. While the Armenian ace was superb in Germany with Borussia Dortmund, he is yet to rediscover his best in England. But Mkhitaryan, who scored in Arsenal’s 3-2 defeat at Chelsea, is determined to improve himself over the coming months and make up for lost time. The 29-year-old said: “I don’t think you’re going to see the Dortmund Mkhitaryan, because in Dortmund the philosophy was different, the playing style was different, the league was different. “Arsenal are playing in a different league with a different manager and different team-mates. I don’t want to see the old Mkhitaryan being here at Arsenal. “I want to be someone new, someone else who can show that he’s capable of doing the same for Arsenal as well. “I’m not just playing football to play, I’m always playing football to win games and titles. “At the end of your football career, people are going to remember you for what you have achieved, what you have won. Emery and co must improve when they host West Ham this weekend but Mkhitaryan insists there’s no need to panic yet. He added: “We don’t have any pressure. We are not thinking that something is going wrong because we’re on the right way. “Even if we lose the first two games, it doesn’t mean we’re not going to finish in the top four. “We still have 36 games to go and anything can happen in the Premier League, everybody knows that.